At the convenience store the other day, I found two new curry-flavored products on the snack shelves. On the left, there is curry-flavored kaki-pi, which is light on the peanuts and heavy on the crescent-shaped rice crackers. 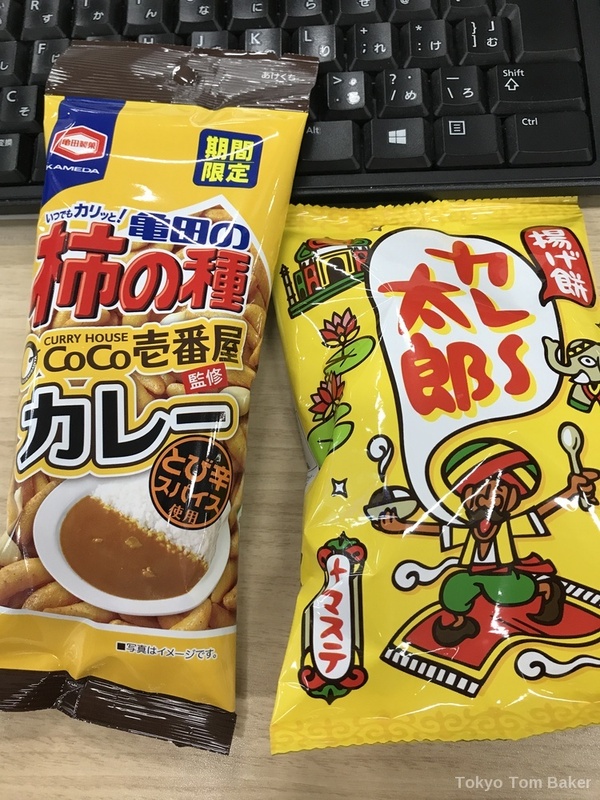 These are spicy and peppery, flavored with curry from the Coco Ichibanya curry chain, which has 1,299 shops all over Japan and 158 abroad. This is a limited-time product from Kameda, a major Japanese snack company. On the right, there is fried mochi that claims to be curry-flavored. The airy nuggets were lightly dusted with a golden-brown powder that was pleasantly sweet and ever so faintly spicy, but I wouldn’t have guessed it was supposed to taste like curry if it hadn’t been written on the package. You can’t beat the price, though. It was just 81 yen for a bag – slightly more on Amazon. You are currently browsing the Tokyo Tom Baker: The Blog blog archives for May, 2017.